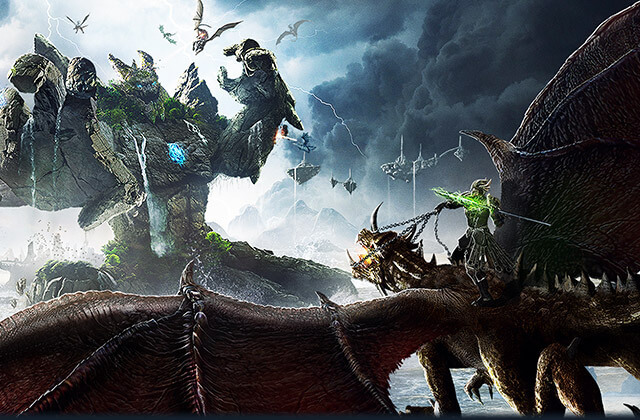 Riders of Icarus – Ride dragons and rule the skies as a Beast Master! Become a Rider of Icarus and soar as far and wide as your imagination takes you in an exhilarating MMORPG fantasy world filled with non-stop action and adventure! Rule the Skies in Battle. Tame and ride fearsome winged beasts into explosive battles as you scorch the skies of enemy legions in thrilling combat. As a Rider, capture and train flying mounts to become deadly weapons in adrenaline-charged aerial battles. Discover a world of wonders and danger as you begin a heroic quest that will take you from the majestic capital city of Hakanas to the outer realms of the world. Riders of Icarus offers a fantasy adventure unlike any other. Embark on a Heroes Journey. Immerse yourself in an epic journey with fellow riders as you work together to complete challenging quests and conquer lethal dungeons in a constant battle to protect the world from an ancient evil that has returned.